Lord Karttikeya is a well known figure in Hindu mythology. He addressed by different names such as Murugan, Subramaniam, Sanmukha, Skanda and Guha. He is most popular as Lord Murugan in the southern states of India. A number of temples dedicated to the deity can be spotted all over the South India. 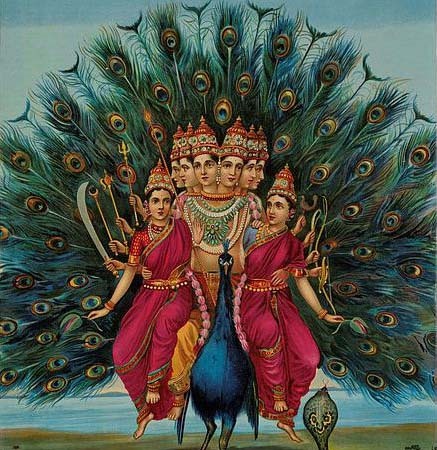 The story of the birth of Lord Karttikeya or Murugan has different versions. In some texts it is said that He is the son of 'Agni' or the God of Fire. However according to the Skanda Purana, Karttikeya is said to be the elder son of Lord Shiva and Goddess Parvati. It is also believed that Karttikeya was not born from the womb of Parvati. The Goddess was cursed by Rati, the consort of Kama (God of Love) that she would never be able to bear children. According to the legends, there was a demon named Tarakasura who asked for the boon that he should only be killed by Lord Shiva's son. He knew very well that Lord Shiva was an ascetic and He would not marry or have children. Hence, Tarakasura would be invincible. However after much ado, Lord Shiva finally married Goddess Parvati. Since Parvati couldn't conceive due to the curse, Lord Shiva took her to a cave and asked Her to meditate. As they both meditated, a ball of fire emerged out of their cosmic energies. In the mean time, the other Gods being insecure from Tarakasura, sent Agni or the God of fire to get hold of the ball of fire. But even Agni couldn't bear the heat of the energy of Shiva and Parvati. So, He handed over the ball to Goddess Ganga. When even Ganga couldn't bear the heat, She deposited the fire ball into a lake in a forest of reeds. Then Goddess Parvati took the form of this water body as She alone could bear the energy of Shiva and Shakti. Finally the fire ball took the form of a baby with six faces. Hence, Karttikeya is also known as Sanmukha or the 'God with Six Faces'. 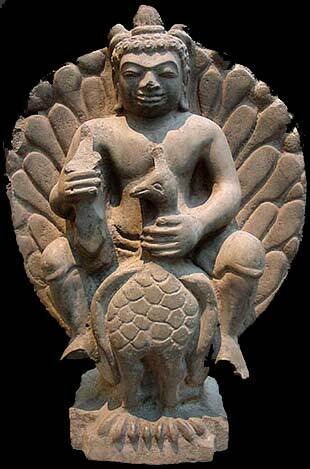 He was first spotted and taken care of by six water nymphs who represented the Pleiades or the Krittikas. So, the divine child was known as Karttikeya or the son of the Krittikas. Later Karttikeya kills Tarakasura and becomes the commander-in-chief of the Gods. Lord Karttikeya is depicted as a dark, young man with a spear in His hand. His mount is a peacock and He symbolizes power and strength. Through the blessings of Lord Karttikeya, one can achieve great strength and get rid of all his woes.  His peacock represents Him as the destroyer of all bad habits and a conqueror of sensual desires. Karttikeya represents perfection and the need for every human to move towards being perfect. 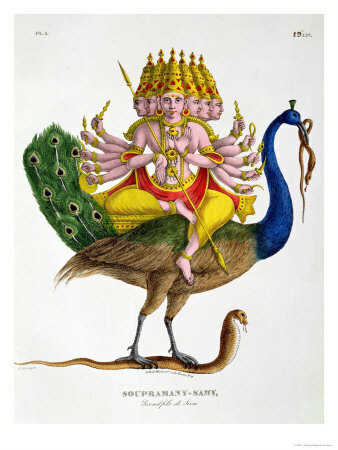 "Skanda: Pan-Indian God of Love and War"